This looks good. Do you find crab species makes a difference? I making this one soon. It sure does…I would still recommend using fresh and locally sourced, but if you can’t find that, I actually prefer the refrigerated canned variety over the frozen stuff. This recipe looks good I will have to alter the crab for tofu or polenta. Seafood is very high in mercury and radiation. Fukushima anyone? No farmed is not safe either because of the antibiotics. So watch seafood consumption! Although I create recipes for all consumers with all dietary restrictions in check, I don’t think this is the appropriate venue to promote your opinion. Thanks for the suggestions though. I am very sorry if I came across rude. However what about people who may not be aware of what is going on in Japan? Is that fair for that knowledge to not be passed on? Actually that was not my goal to create a larger audience. I asked a simple question because we are normally seafood lovers and we have not eaten it in a couple years due to radiation. I was hoping you or someone else could maybe sort out those fears. In the meantime if you hate my comment enough go to the edit section and hit delete. I don’t hate your comment one bit and I really do appreciate you taking the time to check out my blog. Looks great. Fresh crab is hard to beat, sure wish I could get it more often. Wow! Looks fantastic and the sriracha mayo sounds great. Sounds great. Perhaps I’ll try it tonight! WOOHOO!!! I am glad you enjoyed!!!! These sound and look amazing! I really like the idea of using quinoa instead of other filler like bread. Will have to try and make these soon! I hope you do and let me know how they turn out! I think you should! Take a picture and let me know how they turn out. Looks delicious! I think I could modify your recipe a little to make it fit my allergies. I’ll let you know how it turns out! What allergies do you have…I can give some great suggestions! I have Celiac (so no gluten), and I’m allergic to dairy, eggs, safflower, tapioca, rosemary, cinnamon, and annatto seed. (Most of which aren’t in this recipe, but I thought I should be thorough). Perfect, thank you so much for the suggestions. I cannot wait to cook them! Not a problem! I am pretty good with allergen replacement so let me know if you have any other questions. 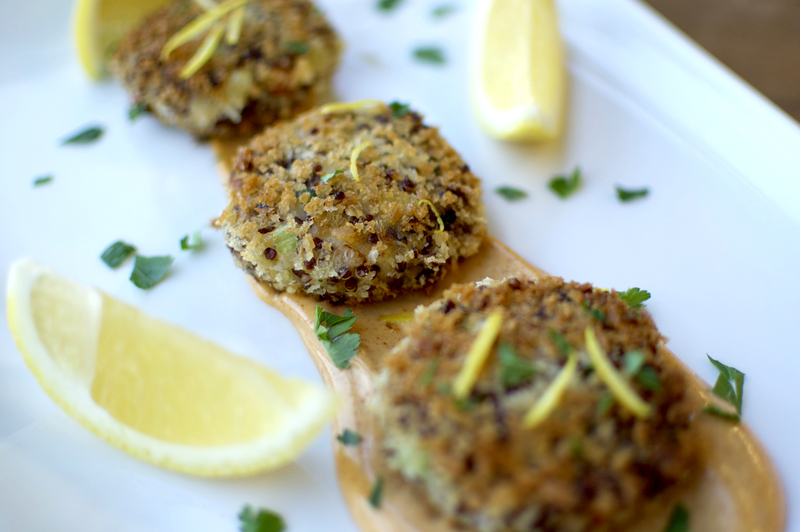 Here’s my attempt at modifying your crab cakes: http://glutenfreelife247.com/2014/01/18/red-quinoa-crab-cakes/. Thank you so much, they were absolutely delicious! Yummy recipe from my friend at Nerdsteak! These look and sound wonderful! I will definitely be giving these a try! Maryland native here. I’m not one for speaking so boldly but I do know one thing for certain in this world…Maryland has the best crab cakes ever…in the world…nay Sir, in the universe. That being said-these look pretty darn good!